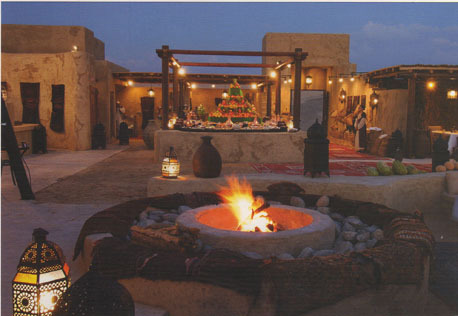 Experience the wild expanse of the desert and the magic of traditional Arabian entertainment at Al Hadheerah, the region’s first open-air desert restaurant. Al Hadheerah offers diners a unique experience with scenes straight out of an Arabian legend featuring belly dancers, henna painters live bands, camel riding and falcon display. The decor recreates the magic of the fort theme with natural stone, rock walls and a sunken seating area. The mood is further enhanced with a visit to the souk area with unmistakable Arabic flavours. The restaurant features ethnic cuisine from the Middle East, as well as live cooking stations with wood-fired ovens, spit roasts and Arabic bread ovens. A one hour drive from the city, you are truly going to experience the isolation and atmosphere of the desert.